For the last couple of months, we've been posting a picture or illustration here every week reminding you of the consequences of passing Initiative 912. Here's this Thursday's Disaster Picture of the Week. The image to the left shows a collapsed section of Kobe's former Hanshin Expressway. 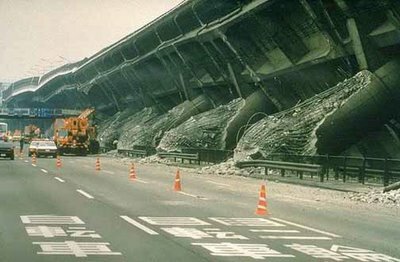 The elevated freeway collapsed in the 1995 Kobe earthquake (Magnitude 7.2, lasted twenty seconds), causing loss of lives and significant property damage. Don't let this kind of a disaster happen to us. Put Public Safety First. Vote NO on Initiative 912. Irons: Passing I-912 would be "a tragedy"
Seattle P-I joins us, asks: Where's Rossi and McGavick on I-912?